KETTY allows the detection and interpretation of novel behaviour by the analysis of telemetry and SCADA systems data without using any a priori knowledge. Priority scores are generated according to how differently the parameters behave in two different time periods; the greater the difference, the higher the priority score, which suggests that the parameter should be further analysed by the engineers. KETTY also correlates parameter behaviour, which may help the understanding of the overall dynamics of the system. KETTY (Knowledge Extraction from TelemeTrY) is a software tool that is designed for the detection of novel behaviour in spacecraft telemetry data without using any a priori knowledge. The purpose of this tool is to help Flight Control Engineers to get more insight into the monitored system dynamics and automatically detect and diagnose anomalous conditions. When thousands of relevant parameters or signals need to be checked by engineers to evaluate the process or system behaviour, the detection of an anomalous behaviour and its possible causes by visual analysis of the acquired raw data becomes an extremely demanding task, given the large amount of data and the possibly hidden cause-effect relationships among subsystems or parameters. KETTY can analyse thousands of parameters generating priority scores depending on the differences in the behaviour of the parameters between two different time periods. The greater the difference, the higher the priority score, which suggests that the parameter should be further analysed by the Flight Control Engineers to investigate if failures have occurred to a component or part of the satellite. Indeed the detection of incipient faults well before a complete failure occurs would potentially allow proper countermeasures, which may restrict the effects of the fault, potentially avoiding the spread to other parts of the system and, possibly allowing recovery of the faulty component or subsystem. Although it was validated with spacecraft telemetry data, KETTY implements a general approach to knowledge extraction, which is applicable to any type of system. Any type of telemetry and Supervisory Control and Data Acquisition (SCADA) systems data may be analysed. Determination of cause-effect relationships between parameters of the system that may not be known a priori. An important characteristic of the developed technology is the fact that no a priori knowledge about the system is required to perform the analyses. It allows long term or short term analyses of the system behaviour to be performed both from a static and dynamic point of view. KETTY is an advanced software system for knowledge extraction from data aiming at novelty detection, diagnostics and behaviour interpretation. The detection of novelties can allow novel working conditions to be detected in the system being monitored or their association with anomalous conditions, detecting potential faults and, possibly, allowing action to be taken to prevent complete failure of the system. The behaviour interpretation of the system is performed through the discovery of cause/effect relations among all data characterising the system itself. The knowledge extraction methods included in KETTY allows both a static and dynamic characterisation of the behaviour of parameters by comparing data acquired in two different time periods, performing both long-term and short-term analyses. One important characteristic of the KETTY technology is that the generated outputs are not Boolean variables (0, normal, 1 novel) but are symptomatic variables ranging between 0 to 1, which are associated with the degree of novelty in the parameter behaviour, i.e. the comparison of the difference in the parameter behaviour in the two time periods. Therefore, the values of the symptomatic variables represent priority scores, which indicate how different the behaviour of the parameters is in two different time periods. The greater the symptomatic variable, the higher the priority score, which suggests that the parameter should be further analysed by Engineers or Technical Specialists to investigate if failures occurred to a component or part of the system being monitored or to confirm whether the observed changes are associated to new operating conditions of the system. Therefore these priority scores allow the generation of priority lists, i.e. lists of parameters ordered according to the priority scores, indicating which parameters should be further analysed first. By comparing the symptomatic variables with suitable anomaly thresholds, diagnostic decisions may be also generated as Boolean variables equal to one when a novelty is detected in the parameter behaviour, zero when the parameter behaviour is considered normal. During other research projects in the automotive field, one method included in KETTY (for the dynamic characterisation of a parameter) was enhanced to perform the automatic online characterisation and novelty detection of a system using no, or only basic, a priori knowledge. For example, Figure 1 shows the result of the novelty detection applied to the driving style evaluation, in which the gas pedal position signal is analysed to detect nervous driving and alert the driver. The example in Figure 1 shows a driving session consisting of five repetitions of the same lap, performed with normal and nervous driving style, as indicated in the figure. Red dots represent the output of the novelty detection algorithm, based on the improved methods, i.e. the time instant at which a novel behaviour is detected. As it can be seen, the novel behaviour is detected corresponding to nervous laps. 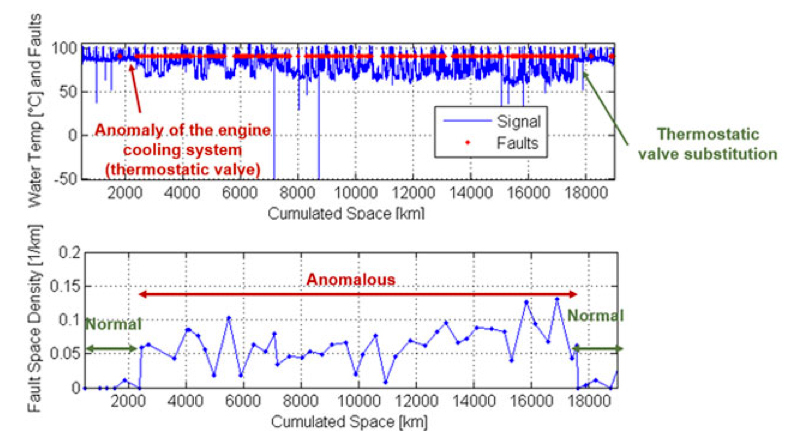 Figure 2 shows the result of the novelty detection applied to the evaluation of the status of the engine cooling system, in which the engine water temperature is analysed to detect component faults. The example in Figure 2 shows driving sessions during endurance tests on a sport test car, in which the driver marked the occurrence of faults of the thermostatic valve. As can be seen, the red dots indicating the detection of anomalous conditions by the improved method are observed in the driving sessions characterised by anomalous values of the engine water temperature. This technology has been developed under the project Automatic Behaviour Detection and Interpretation from Low Level Datasets such as Telemetry (Contract No. 4000109978/14/D/EF between the Italian donor company and ESA/ESOC), focusing on the analysis of the telemetry data from the XMM satellite. The methods for the determination of cause-effect relationships were defined and validated also in the project Automatic Spacecraft Status Characterisation by Data Mining Mission History (Contract No. 4000112224/14/F/MOS between the Italian donor company and ESA/ESOC), focusing on the analysis of telemetry data of the VEX satellite. KETTY (Knowledge ExtracTion from Telemetry) was designed to allow the detection of novel behaviour in S/C telemetry data and get insight into the S/C dynamics, without using any a priori knowledge. This software was developed under the ESA contract for Automatic Behaviour Detection and Interpretation from Low Level Data Sets such as Telemetry.